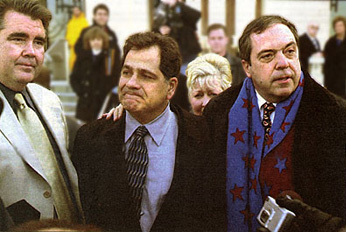 Slain Cop's Pal Walks Free - Paul J. Ciolino & Associates, Inc.
Rich Chapman/Special to the Courier News – John Carroccia (center) leaves court Tuesday with investigator Paul Ciolino (left) and lawyer Stephen Komie after his acquittal. 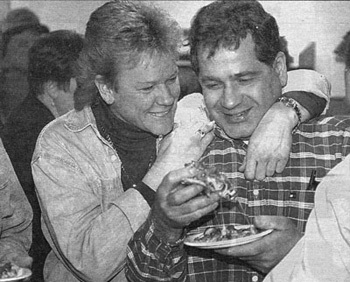 Carroccia’s fiancee, Nancy Locascio, is behind him. The Kane County jury that acquitted John Carroccia on Tuesday saw so little evidence tying him to the murder of Hampshire Police Sgt. Gregory Sears that jurors would have reached the same conclusion without even hearing Carroccia’s defense, the jury foreman said Tuesday. “There just wasn’t enough direct, evidence not to have reasonable doubt. If the defense would have rested [immediately] after the prosecution, the result would have been the same,” foreman Randy Blackburn said, after jurors deliberated for barely two hours before rejecting the murder, charges against Carroccia. The 51-year-old defendant lowered his head and sobbed in court as he was acquitted of the June 1, 2000, murder of Sears, his best friend since childhood. Several members of Carroccia’s extended family who were in the packed courtroom cheered briefly, while others burst into tears and embraced each other. The six-man, six-woman jury heard more than two weeks of testimony in the case, but prosecutors offered only circumstantial evidence that jurors said didn’t prove to them Carroccia was the one who fired three gunshots into Sears’ head in a darkened Hampshire industrial park. friend had recently married a woman he didn’t like. Several blood spots found on Carroccia’s clothing proved to be his own blood, according to tests. Other tests that looked for gunshot residue on Carroccia’s hands, clothing and in his van were inconclusive. Carroccia faced life in prison had he been convicted. He never testified during the trial. His lawyers blasted prosecutors after the verdict for even bringing charges against him, saying authorities “rushed to judgment” without thoroughly investigating other possible suspects-including Sears’ widow. “It’s insane to believe someone is going to kill their best friend for marrying the wrong girl,” said Stephen Komie, who with Jack Rimland represented Carroccia. 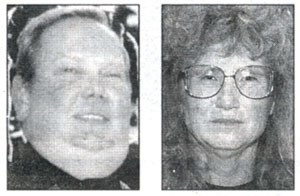 During the trial, they focused on Sears’ wife of three weeks, Norma Jean Sears, as a possible suspect. She first pointed police toward Carroccia as a suspect, and collected about $250,000 in insurance and death benefits after the killing, according to court testimony. Called by Carroccia’s attorneys, she testified during the trial that she developed amnesia in the months following her husband’s slaying and couldn’t recall anything that happened the night of her husband’s murder or during the next three weeks. “That had no bearing one way or another on what we decided in there,” he said. Kane County police and prosecutors said they have no plans to reopen the investigation into Sears’ death, apparently the first murder of a law officer in Kane County in at least 20 years. Kane County Sheriff Ken Ramsey, whose detectives led the investigation that resulted in Carroccia’s arrest, echoed that sentiment and said he was disappointed by the jury’s verdict. Neither of Sears’ elderly parents was in the courtroom, nor was Norma Jean Sears: But nearly a dozen police officers from Hampshire and Gilberts, where Sears worked part-time, left the courtroom looking stunned. “June 1,2000 was an injustice. Today was an injustice,” said Gilberts Police Sgt. Jack Rood, a friend of Sears’. John Sall / Sun-Times – John Carroccia gets a big hug from longtime friend Tammy O’Neill on Tuesday in Morengo while he celebrates his acquittal on murder charges. After nearly two years of living with the possibility he might spend the rest of his life behind bars, Carroccia instead spent Tuesday night celebrating freedom in a house full of relieved family and friends. Even so, he said that as the verdict was being read he clutched a rosary and prayed. He was so focused on praying that he didn’t hear the verdict. “I didn’t hear what they said, but I knew it was good when I saw my family smiling and happy,” Carroccia said.